FILE - American Ambassador to the United Nations Nikki Haley speaks to reporters at United Nations headquarters, Jan. 2, 2018. Nikki Haley, the United States Ambassador to the United Nations, said Thursday a U.N. report on poverty within the country was "ridiculous." "In our country, the president, members of Congress, governors, mayors, and city council members actively engage on poverty issues every day," Haley wrote, in a letter to U.S. Senator Bernie Sanders, an Independent from Vermont. "Compare that to the many countries around the world, whose governments knowingly abuse human rights and cause pain and suffering." The U.N. report, released earlier this month, highlighted economic inequality and claimed policy pursued by the Trump administration would exacerbate the country's wealth gap, further hurting the poor. "The policies pursued over the past year seem deliberately designed to remove basic protections from the poorest, punish those who are not in employment and make even basic health care into a privilege to be earned rather than a right of citizenship," the report read. 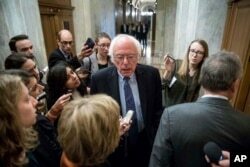 FILE - Sen. Bernie Sanders, I-Vt., center, speaks to reporters on Capitol Hill in Washington. The report found the U.S. "leads the developed world in income and wealth inequality," that 40 million in the country currently lived in poverty, and U.S. citizens lived "shorter and sicker lives compared to those living in all other rich democracies." Phillip Alston, a U.N. adviser on extreme poverty and the author of the report, said the Trump administration was not solely responsible for the report's findings — rather, a systemic issue in American politics. "The persistence of extreme poverty is a political choice made by those in power," Alston wrote. "With political will, it could readily be eliminated." The statistics Alston used in the report are from 2016, before Trump took office. On Twitter, Alston said the numbers from 2017 — the first year of Trump's presidency — will not be available until September. Alston called poverty a "structural problem," and said the Republican tax plan passed into law in December would only worsen it. The Trump administration is no stranger to friction with the U.N. On Wednesday, Haley announced the U.S. would be leaving the U.N. Human Rights Council, proclaiming it to be unworthy of its name. "Look at the council membership, and you see an appalling disrespect for the most basic rights," Haley said Wednesday, citing nations such as China, Russia, Venezuela, Cuba and the Democratic Republic of the Congo. It was a similar refrain Thursday, as Haley said the U.N. should focus on poverty in other countries such as Burundi and — again — the Congo. While Sanders agreed with Haley's notion of the developing nations facing more severe poverty, he said Thursday he felt Alston's report was "appropriate." "I hope you will agree that in a nation in which the top three people own more wealth than the bottom half, we can and must do much better than that," Sanders said. Elise Gould, a senior economist for economic advisory group the Economic Policy Institute, said the U.S.'s high level of economic inequality is due to, among other things, a weaker social safety net and fewer labor rights than its fellow developed nations. "There's not one silver bullet," Gould said. "There's a menu of options that could help these people out of poverty."